The Chaplins had been landowners in Lincolnshire since 1658. 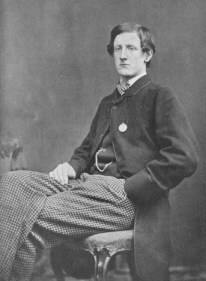 Henry Chaplin was born at Ryhall hall, near Stamford in 1841, third son of the Rev. Henry Chaplin and Caroline Horatia. Henry Chaplin came into his inheritance which included Blankney Hall and large estates in Lincolnshire, Nottinghamshire and Yorkshire when he was 21. His social circle was of the highest in the land with one of his closest friends being Queen Victoria’s son Bertie (the Prince of Wales), who in 1901 became King Edward VII. Through living the life style of the landed gentry, he spent much time in London and, in the summer of 1864, soon became aware of a young lady called Lady Florence Paget (better known in their social circle as “The Pocket Venus”, due to her great beauty and tiny figure. He fell in love with Lady Florence. The engagement was brief and their wedding as due to be the society event of the year. Chaplin's good friend from Oxford, the Prince of Wales was one of the first to offer his congratulations. Chaplin set about improving Blankney Hall for his bride and prior to the wedding he entertained her at his stately home, Blankney Hall, showing her all the charm of her future abode. They returned to London and spent an evening at the opera. The following day she showed her father her wedding dress, which suggested all was well…. but was it? Chaplin was not the only eligible bachelor to be attracted to Lady Paget. Lord Henry Plantagenet, the 4th Marquis of Hastings had also taken a fancy to her. 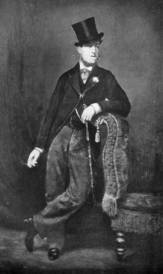 his one-time close friend Henry Hastings, 4th Marquis of Hastings also had a fancy to her. Hastings, too, had inherited a massive fortune when he had become of age the previous year. He used much of this fortune in purchasing expensive racehorses and even more on gambling wagers, which would lead to his eventual downfall. Aware of her engagement to Chaplin, he nevertheless, pressed his attentions upon her. Unbeknownst to Chaplin, she responded to Hastings advances and the scene was set for one of the social sensations of the year. The next day under the pretext of needing to complete her wedding trousseau, Lady Paget left Chaplin in their hotel to visit Marshall & Snelgrove's, a fashionable Oxford Street store. Entering the store she glided through the premises, giving a charming glance to all, before disappearing out of the rear entrance into the arms of her lover The Marquis of Hastings! The two got into a waiting carriage and within the hour they were married in the church of St George’s, Hanover Square. Only relatives of the Marquis were at the wedding as Florence’s friends and family knew nothing of the event, having received invites to what should have been the social wedding of the year between her and Chaplin. Following the wedding of the “new” Marchioness’ a reception was held in St James’ Place before the newly weds went off to Scotland prior to a longer stay in India whilst the sordid scandal died down. Prior to leaving Florence wrote to the jilted Chaplin advising of her actions and this was to lead to Chaplin being a ppublic laughing stock and in his mind a social outcast. Chaplin in the wake of being jilted at the altar became obsessed with gambling and racing……. It was said ”he bought horses as if he was drunk and betted as if he was mad”.